It's been a long time since I've really posted anything on this site. It's kinda weird looking at my old customs and seeing how much the way I play has changed... So I decided that it was time for a new thread. And here we are, a year after I started this thread, and the way I've played continues to evolve. And where would Mickey be without Minnie? TBH probably living a less stressful life. 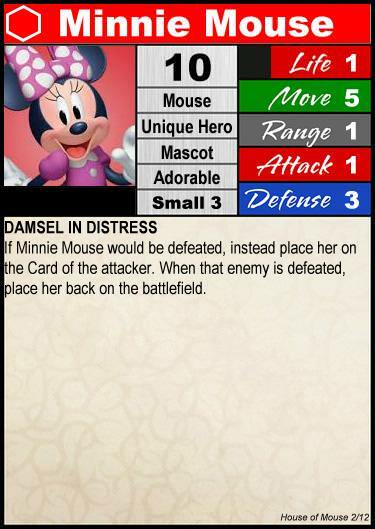 What we discovered while brainstorming for Minnie’s card is that she never really does anything. She’s either the princess being kidnapped, the girl Mickey’s standing up to Pete for, or else she’s kinda… there. So we played that up as much as possible and ended up with a card that technically never dies, but can lead to some hilarious situations. 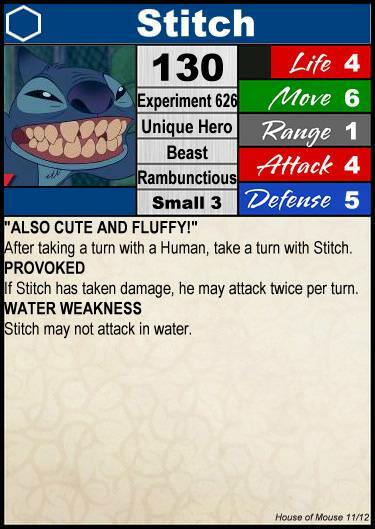 This was one of the first cards we made, and one that really set the tone for this project. I’m really proud of the power names on his card. So while we were brainstorming, my wife goes, “what if he had a power that just… makes him go nuts?” After about 10 minutes of back and forth, this is what we ended up with. Is it balanced? Oh heck no. I like to think of Animal as a custom in the order of @ollie ’s Unsaintly Customs. 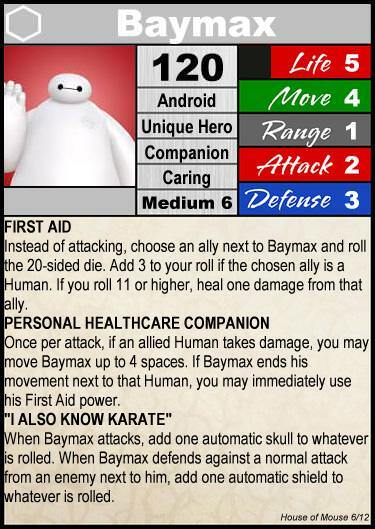 Another custom that practically wrote itself, Baymax plays very like you’d expect him to: He runs around and he helps people. Initial testing indicates that he needs to be tweaked, but it’s super fun to play him and Bizzaro in the same army. 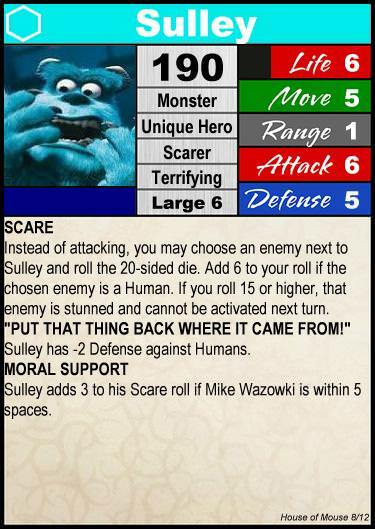 Sulley is perhaps the best example of my weird love/hate relationship with Stun effects. I’m honestly not sure if it’s ever worth trying to stun over dealing damage. Thoughts anyone? 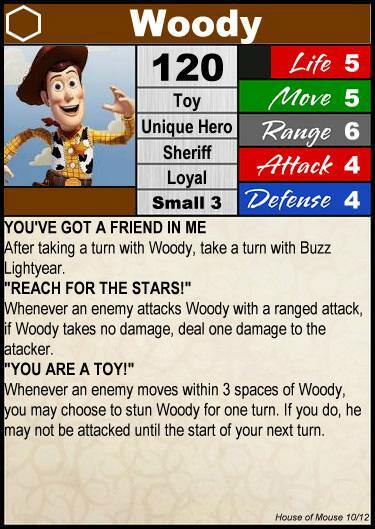 Woody is an example of a card that is technically broken because of shortcuts I’ve taken with wording. As written, you could stall a game forever against melee characters because they’d be moving zero and triggering the ability. He’d need wording closer to War Machine, but clunky wording is confusing to new/younger players. Like Woody, Buzz is a bit stylized. 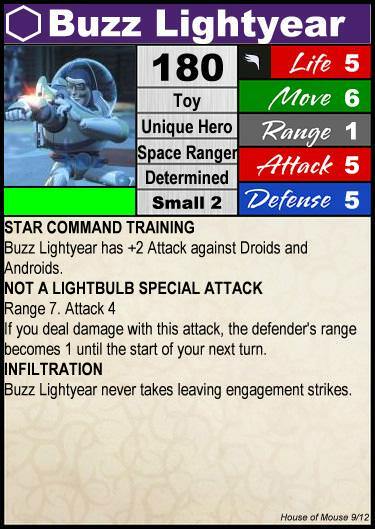 He’s got the stats he would have if he was a full sized Space Ranger, but his size and his Not a Lightbulb SA are nods to him being a toy. 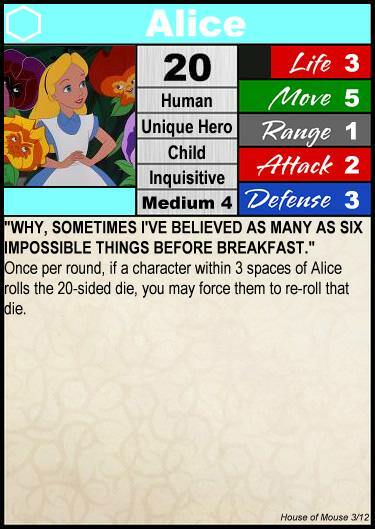 Another off the wall card from the mind of my wife lol This card creates some weird moments and unintentionally interacts very thematically with Alice. 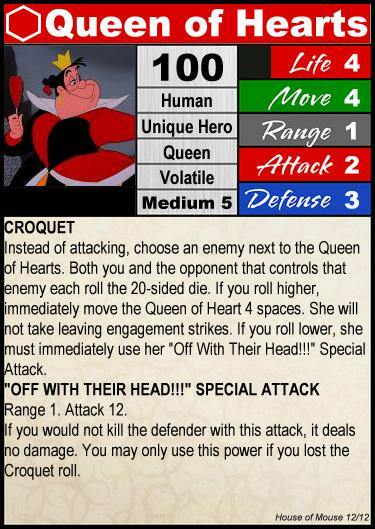 Since I’m unable to use C3G’s knockback rules, I’ve been looking for a way to incorporate knockback on a card. Family First means he can easily swing for 7 or 8 and that means you send people flying! 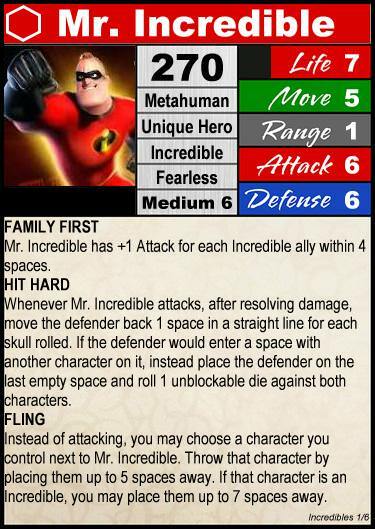 He synergizes well with Elastigirl to punish melee characters. 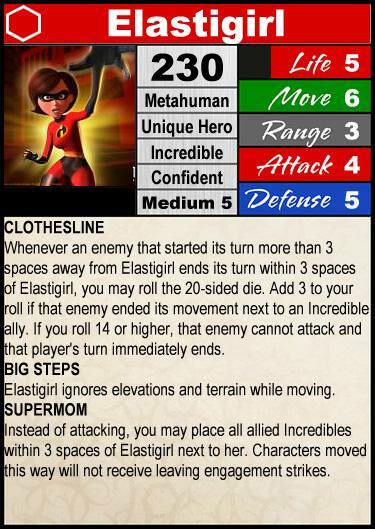 Elastigirl doesn’t have a strong offense, but she can both set up your pod of Incredibles and make life difficult for opponents. 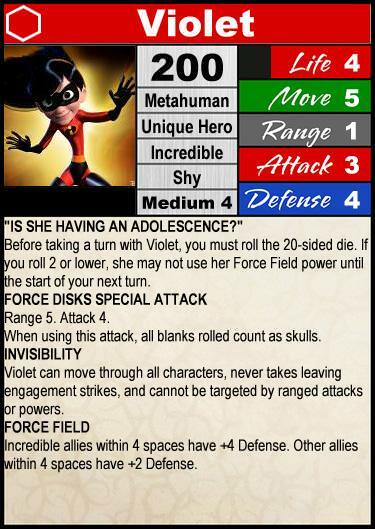 Since Violet’s powers are basically identical to Invisible Woman’s I used her C3G card as a starting point. After that, I added Force Disks SA because was one of my favorite developments in her moves in Incredibles 2. Finally, “Is She Having An Adolescence?” felt like the perfect way to represent her struggle with her identity and keep her card in check. Overall, I like where her power level ended up. 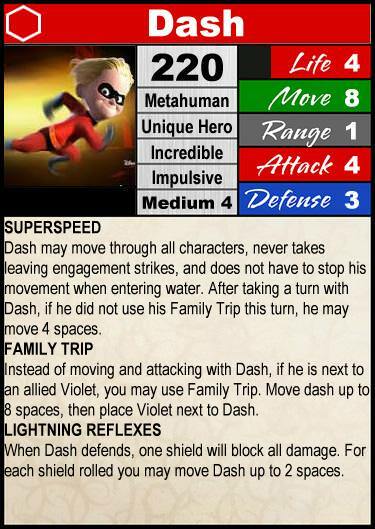 In a lot of ways, Dash is just a weaker Speedster like Flash, so instead of trying to give him teeth, he ended up with Family Trip. It’s not the strongest power, and he’s one character I feel could probably be priced less. Of course I had to work that quote onto his card. 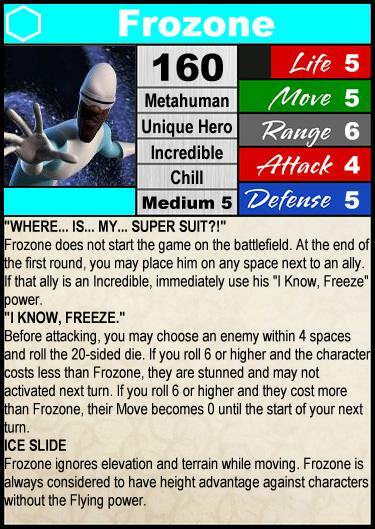 Unfortunately, since I don’t play with commons or squads, his “I Know, Freeze” is phrased to check the target’s point cost. I’m waiting for a bigger game before I decide if that’s going to be the final version or not. Welcome to the Battle of Hogwarts! Shout out to the Heroes of Fiction for their Expelliarmus power! For my version of Harry Potter, I wanted to incorporate the Patronus Charm, so here's my take on that spell. 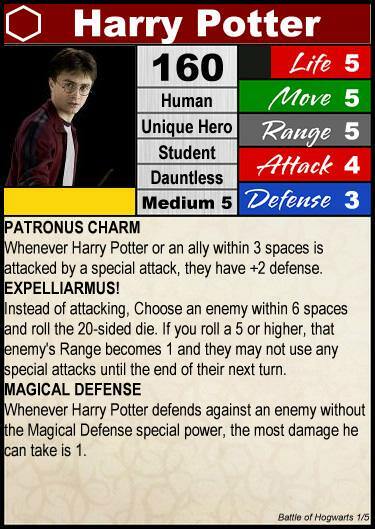 Whenever Harry Potter or an ally within 3 spaces is attacked by a special attack, they have +2 defense. 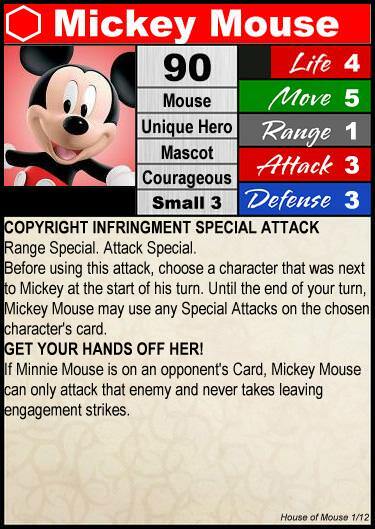 Instead of attacking, Choose an enemy within 6 spaces and roll the 20-sided die. 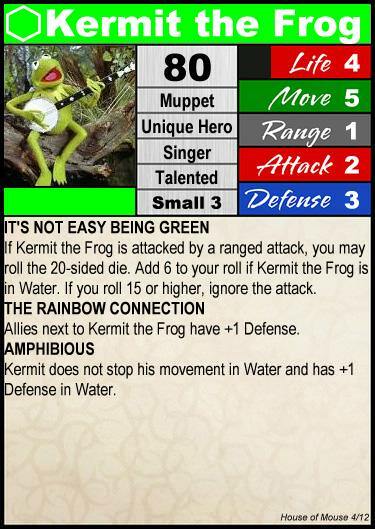 If you roll a 5 or higher, that enemy's Range becomes 1 and they may not use any special attacks until the end of their next turn. Whenever Harry Potter defends against an enemy without the Magical Defense special power, the most damage he can take is 1. At the end of the round, you may place Hermione Granger on any space up to 4 spaces away. 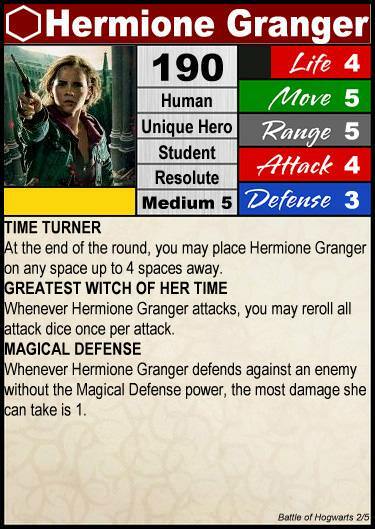 Whenever Hermione Granger attacks, you may reroll all attack dice once per attack. Whenever Hermione Granger defends against an enemy without the Magical Defense power, the most damage she can take is 1. 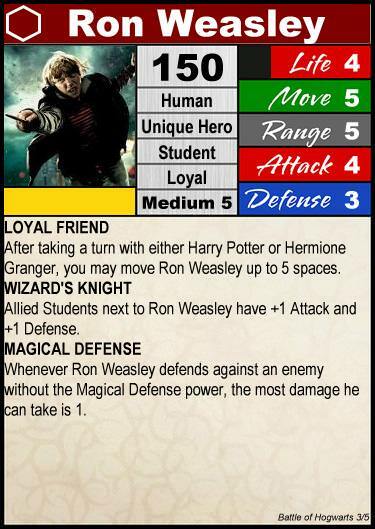 I've always felt Ron Weasley's greatest quality is his loyalty, so I tried to strike a balance between theme and playability when it comes to who he can help. After taking a turn with either Harry Potter or Hermione Granger, you may move Ron Weasley up to 5 spaces. Allied Wizards and Witches next to Ron Weasley have +1 Attack and +1 Defense. Whenever Ron Weasley defends against an enemy without the Magical Defense power, the most damage he can take is 1. Muggle Hatred was an easy way to give him some umph, Flipendo is based off of C3G's Knockback Rules. Whenever Draco Malfoy deals damage, if you rolled more skulls than the defender, you may place them up to 3 spaces away from their current location, as long as they are placed further away from Draco Malfoy. 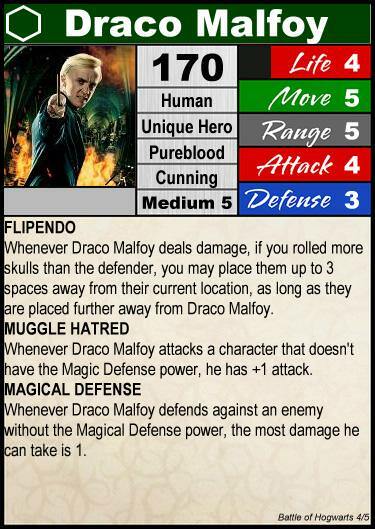 Whenever Draco Malfoy attacks a character that doesn't have the Magic Defense power, he has +1 attack. Whenever Draco Malfoy defends against an enemy without the Magical Defense power, the most damage he can take is 1. This is the first design that I've fully collaborated with my wife on, and I'm very happy with how it turned out. The play between Deranged Hatred and Crucio means she can play very differently depending on her matchup. EDIT: While the Metal Nanofigs have been amazing and allowed me to create a lot of characters I never thought I'd get to make, Bellatrix doesn't have a figure. The custom fig I made is much smaller and much, much more frail, and thus has been removed from my character pool for now. Whenever Bellatrix attacks a character with the Magical Defense power, she may attack them a second time. 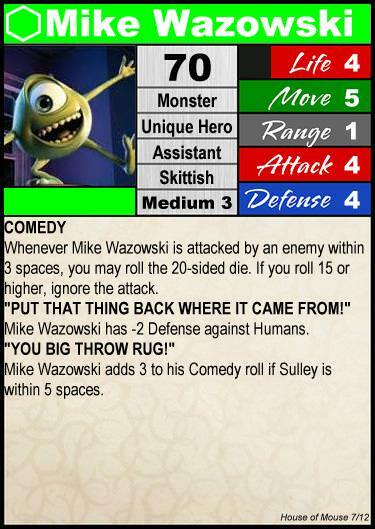 Instead of attacking, choose a character within 5 spaces and roll the 20-sided die. 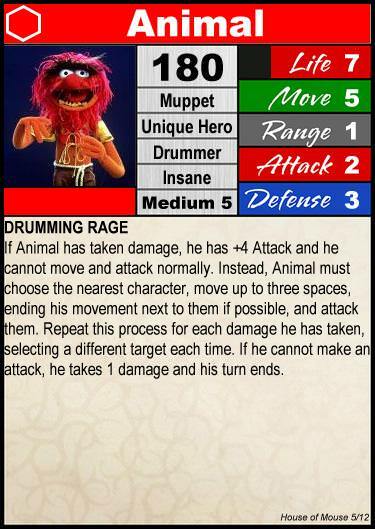 If you roll a 14 or higher, that character takes 1 damage and is stunned and may not move next turn. If Bellatrix used this power against a character that doesn't have the Magical Defense power, you may roll for this power a second time. 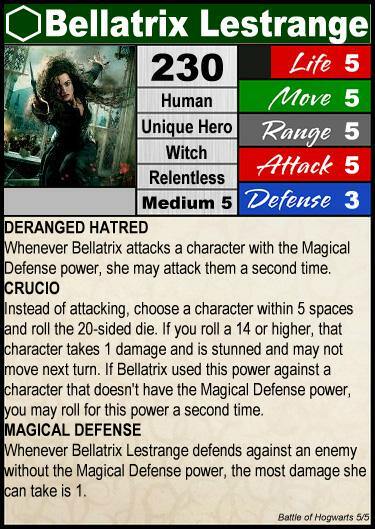 Whenever Bellatrix Lestrange defends against an enemy without the Magical Defense power, the most damage she can take is 1. Last edited by Sir Yeshua; August 22nd, 2018 at 11:50 AM. 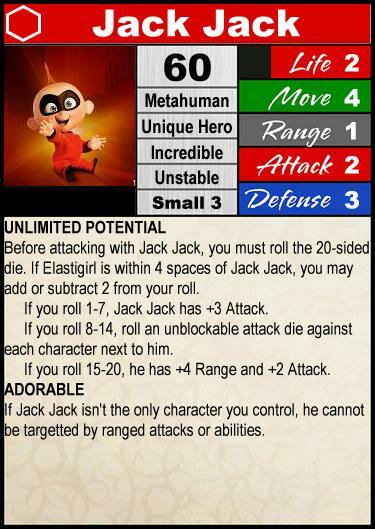 Reason: Incredibles! Would anyone be interested in seeing traditional cards posted for these guys? Cause I'll gladly make the conversion if it means I can get feedback. C3G is working on something that will really open some options for these characters. Ooh, I'm intrigued... I knew something magical was afoot because of the chatter in the reeval thread. I can't wait! Within the last 6 months, I’ve gained a new addiction hobby: collecting Jada Metal Nanofigs and making Heroscape cards for them. These customs don’t follow any generals, generally have simpler powers, and generally do some crazy stuff. My wife and I had an absolute blast making and testing these cards, and I hope you’ll enjoy them too! A couple pairs of friends, an alien, and a mad Queen. As you might suspect, The Incredibles are designed to work together as a team, although I don't usually play with enough points for someone to run all of them at the same time. I'm super happy with how these designs turned out! Last edited by Sir Yeshua; August 22nd, 2018 at 06:11 PM. These are great! (Except I can't see the card for Mr. Incredible which is probably important). Weird, it showed up in the OP... Oh well, it should be fixed! Cool stuff here. I was wondering what figures you were using then saw the Nanofigs. I have been at work making a bunch of figures without previously available minis as well. If I get around to it maybe I'll have to 3d print these figures in 28mm heroic for my little girl to get her playing more heroscape. I already printed her a frozen figure of the Anna character and have stl's for sulley and mike already on my computer.